If you’ve been stuck in Beirut traffic, you’ve probably laughed at Clint Maximus’s jokes on his afternoon radio show on Radio One. 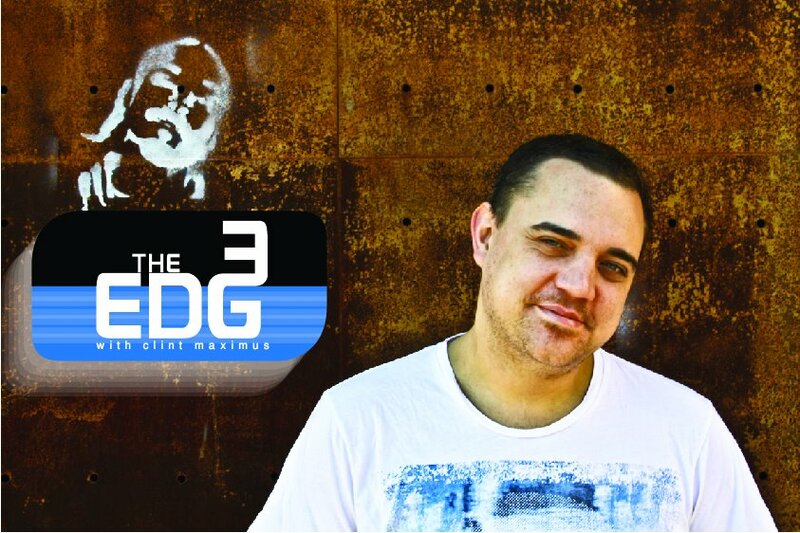 But besides being a broadcaster since the age of 16, he’s also a serious DJ who started out in the garage with friends in high school and has moved up the ladder to now have The Edge Radio show on radio stations in over 60 countries. Check out our exclusive interview with the British-born DJ. My DJing career started when I was in high school. I used to DJ things like jungle music, drum and bass, I used to be heavily into buying vinyl. Back then we were getting CDs but we still used to go down to a vinyl store. I kind of miss that by the way, everything is digital these days but still going to a vinyl store was a lot of fun. So I guess it was from there, in the UK back in the early 90s, me and a few friends just hanging out in garages and DJing music and stuff. From there I went to trance music, from trance music I went on to house, from house progressed right onto the stuff that I’m playing now. Any DJ I guess who you could say is pretty good. For example before I actually started The Edge Radio Show I used to be a chef in a kitchen and back then I used to listen to Pete Tong while I was cooking away in the kitchen. I listen to Pete Tong, I listen to Judge Jules on BBC Radio One since I was like 20 cooking away. Well right now I don’t really stick to one style of music. I think times change a lot. Different styles of music, they come back. If you listen to the new Daft Punk album, soul and funk has all of the sudden been thrown back at you! Right now in the UK, different parts of America, all over Europe dubstep is like the biggest thing now. So I mean give it a couple of years and there’ll be something else that’ll come out as well. So do I define myself into a genre? No. I just play whatever sounds good. Well right now I’m on Radio One on the Maximus Experience, Monday till Fridays 4:00- 7:00 PM. But if you want to hear me DJ definitely check out The Edge radio show on Fridays from midnight with myself and my partner from Hollywood Antonio Giacca. We have superstar guest DJs every week on that show. It’s really booming now it’s doing really well, and plays on over 60 radio stations across the globe, not just Lebanon. knows what you’re playing and really gets your music, it’s such a good feeling. Like when you’re mixing in the next song and people come up to you knowing what that next song is going to be, it’s awesome. I don’t have any albums but I do have a new electric trio group that I’ve worked on called Dirty Chips. Which is myself, G Morriss from Pervert Records and also Shant right here from Lebanon as well. We’ve basically gotten together and we’re making tracks now, doing a lot of stuff. I can tell you that we’ve remixed one of the top 10 DJs in the world and also one of the biggest female vocalists that we are remixing right now, and original tracks. I can’t really tell you too much! Fingers crossed we’ll see what happens with that. Hopefully on a beach somewhere, in boxer shorts not doing anything, being a multi-millionaire. Wishful thinking! No I’ll probably be on a radio station somewhere in the world, doing what I’m doing now still. Hopefully having a family. Satisfying everyone, I would say. I don’t like going into a club an people tell you what to play. Keeping up with the music as well, that’s very very tough. Because of The Edge radio show I go through something like 200-300 songs a week, listening to different promos, records that artists and labels have sent me. It’s very difficult to filter out tracks that could be the next big thing and tracks that you don’t think can make it into the show. There’s a lot of difficult things about being a DJ I think. I’m going to have to be very biased here and say the music! I was just complaining that you have so much music coming in but that could also be a good thing. As I said 200-300 tracks a week can’t be bad. When you find that gem, when you think oh this is a good track! And keep in mind that with the shows I’m doing, I’m getting music months in advance. So I listen to it and think that’s going to be a hit, and when it hits and it does that’s like wow, I found that tune, I knew that was going to be a big hit! Another things that’s good, DJing and getting response from the crowd, people coming up to you saying they think you’re doing a good job. Lately I’ve been going to the gym… that’s been kind of cool, trying to lose weight, trying to look good. Still into video games and I do reviews as well, but I supposed that’s a hobby more than actual work. I look after the animals I have, cats, dogs, there’s lots of pets I’ve got in my house. Where can we follow your news and updates? Do you have a fanpage? What’s your favorite tune on your iPod right now? You know there’s so many tunes right now. Macklemore Can’t Hold Us, that song is constantly repeating in my head and on my iPod. I am originally from the UK, born and raised. I moved to Seychelles when I was about 14, back and forth. My mother is actually from the Seychelles so I’m half Seychellois. And then Lebanon. It was a guy who used to work at Paradise FM in the Seychelles at the time, who practically taught me how to broadcast, and he said to me, do you want to come over to Lebanon? At the time I wasn’t sure what Lebanon was, I didn’t know the country. I asked my dad and he said he’d ask the embassy and they really encouraged me to go. I came with a suitcase, $500 and that was it. I stayed. How long have you been here, and what’s keeping you in Lebanon? 11 years in July! I think Lebanon just gets a hold of you. Everyone who’s in Lebanon complains about it and the second they leave they want to get back. I like it, everyone treats me well, everyone’s really nice, what’s not to like? Older PostLive like YOLO at White this Summer!